In August, the NPCC (National Pavement Preservation Conference) came to Nashville. It was at this point that the pavement industry was reintroduced to something that it had been acquainted with for a long time- thin asphalt overlays. Of course this was a learning point for them as these overlays were a new version of the ones that were previously used in these projects. Thin overlays that are used to preserve pavements are very versatile & adaptable. A range of aggregate sizes may be used in these mixes and this is dependent on the thickness of the overlay. The aggregates used could vary based on the quality & friction requirements; in turn this is decided by the amount of traffic that surface sees and where its location is. There are a number of different binders available such as recycled asphalt shingles, reclaimed asphalt pavement & ground tire rubber. These may be incorporated into the mix to improve environmental sustainability as well as for cost reduction of the installation. And so when there is talk about thin asphalt overlays, they could be a mix-and-match of any of these materials. Like all other preservation treatments, thin asphalt overlays are also designed for use on structurally-sound pavements that are in a good condition. For instance, if there is a road that is in a relatively good condition and it sees light traffic, a thin mix overlay can be used on its surface. It can be upto 3/4th “thick and this makes it a very cost-effective option. 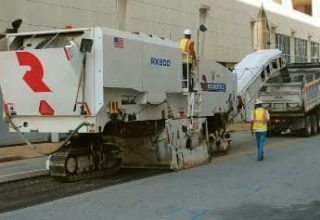 The process used in applying thin asphalt overlay is the same as is used in conventional paving. However, since the layer is significantly thinner, it also cools much faster. In the case of a thin overlay, the rollers have to be operated at night, on the heels of the paver, to ensure they get compacted well. It’s also important that the best paving practices be incorporated into the project at every stage. This ensures the paving material will be of the highest quality and that the installation will integrate well with the pavement.